Contests on social media have a tremendous marketing power. Execute them correctly and you’ll generate results that only cost a fraction of what the price for them is. With clever contests, you’ll both increase brand-awareness, and drive people into your sales funnel. 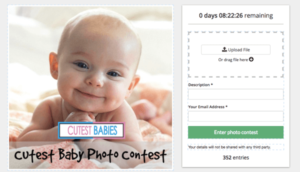 In this article, I’m providing you with my favourite 4 Tips to Creating Social Media Contests that boost sales. The reason you run contests is to reach more people, build brand awareness, build an audience, and attract new customers. Well, this can only be done successfully if you reach the people who matter to your brand. You can reach people all you want, but if they aren’t in your target audience, nor interested in your niche, there will be a problem. If you reach people who aren’t within your audience, they are only entering your contest because they want the prize. When the contest is over, they’ll unfollow your brand, and run from it as quickly as they can. This is where creating contests with target audience appeal comes in helpful. Reaching your target audience is not only important in giveaways, but in all types of marketing efforts. What if you are paying for a Facebook ad, and 20% of the people you reached couldn’t care less about the ad you showed them? That means 20% of your advertising budget was more or less wasted. I’ve said it in a previous article, but I’ll say it again. The better prizes you give away, the more contestants you’ll have. If you’re giving away a car, you’re giving away something valuable, and something that most of the world’s inhabitants wouldn’t say no to. You’re appealing to a large audience, not your target audience. Okay, so the better the prize, the more contestants. But what about if you only want to reach those who truly matter, and are the people you are looking to reach? Then, my friend, the prize should be all about relevance. If you are giving away a hockey stick, you can be sure that the majority of contestants are playing hockey. The bottom line is that you should give away things that relate to your brand, and the interests your audience have. 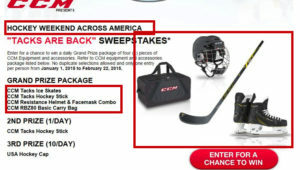 Just look at CCM´s giveaway and all the components they use to only attract people who have an interest in hockey. If you want to attract a rat, what do you use? Cheese, of course. Well, if you would use a fruit instead, what would happen then? You’d probably see fewer rats and plenty of other animals. In other words, animals that you didn’t want to attract from the beginning. When setting up your contest, not only the price will affect what people you attract. You can also tie your contest with an event that only resonate with a particular group of people, known as your target audience. Level ups are great because they help you further boost your exposure. It’s just like customer retention. Instead of always hunting new customers, why not make sure your existing customers are having a good time, and in this case get them to do level-ups. Normally, you can only join a contest once. But why is that so? If someone can recommend your giveaway to 1 or 10 friends, what would you choose? That’s why level-ups are, in my opinion, necessary, or at least highly beneficial to you if you want to get more traction with your giveaway/contest. Offer contestants ways to enter your giveaway several times and thus increase their chances of winning. This is a win-win situation where you get more exposure, and they get a higher chance of winning. 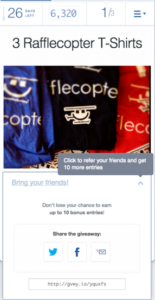 Contests are often structured around social shares. Normally, it’s something along the line of “share this post, tag us, and use hashtag ____”. This is a rule of entry that demands a little bit more effort than if you are to only tag a person in a post, for example. This means you need to have a great price to convince people to do it. But then, you should also offer them a level-up if they repost your image several times! Because it means more exposure for you! And hopefully, you’ll get more contestants as a result of it, thus further boosting your exposure. This is the most common social media contest, only without the level-ups. Normally, when the winners of a “tag a friend” contest are to be selected, every comment in the comment section are given a number and then randomly selected, with the help of a tool like RandomPicker. For example, if you have the rules of entry that you should tag one person, every comment counts as an entry. Just make sure the people who they are tagging are actually real people, not celebrities, or other random accounts. Because, as you can imagine, it won’t help you one bit if people are tagging celebrities or bots. It won’t help you get more exposure. A referral entry is simple. When you join, you are handed a coupon code, or a personal link. When someone uses that to join the giveaway, you get an extra entry. This is great because it means that people will go out of their way to promote your contest. In other words, free marketing people who market your contest. I wouldn’t say no to that. This is a variant of “repost to win” contests, only that, most often, it’s some kind of photo contest, meaning you are the one taking the image (normally based on the brand’s request). Sounds complicated? Hashtags are used on social media to categorise posts. When you add a particular hashtag to your post, that post will be registered and easily found by the brand. A type of contest that brands sometimes run is this form of contest, only that they aren’t choosing the winner. Instead they say that the post with the most likes wins the contest. This might have been effective back in the days, but it’s not highly effective now. Of course, those with the largest followings will get the highest number of likes. This means that plenty of people will be discouraged to join, thus limiting your campaign from reaching its fullest potential. Also, because it is so easy to buy followers today, this method is almost invalid if you want a correct result. This one is a bit fairer, but can still be more beneficial to those with large audiences on social media. To get more control, you can have the voting on your very own website. The contestants send in their posts, encourage their social media followers to vote for them, drive people to your site, and ultimately, those people might decide to buy from you once they’ve entered your site! We’ve already touched on how you can get people to spread the word about your contest and brand without having to do anything. But sometimes, you need that extra push, which is ads. When running ads, having something to tempt people with is super helpful, as it works like a tripwire. People see that they can win a product they go to your site, fall in love with your products, and then decide to buy them. That’s just one of many scenarios. The thing is that gaining traction with a giveaway if you don’t have a large social media media following is difficult. If you have a following that is close to non-existent, chances are you’ll only receive few entries. Here, paid ads can be helpful to get you started. If you’re running your contest on Instagram, using Instagram ads is the most reasonable choice. If you are running your contest on Facebook, using Facebook ads is the most logical choice. This also brings us back to point number one. With social media ads, you have a great opportunity to target the people you want to reach, and target them based on a variety of different criteria. In fact, Facebook even claims that you can get people to purchase from you by promoting deals (giveaways) with Facebook ads. 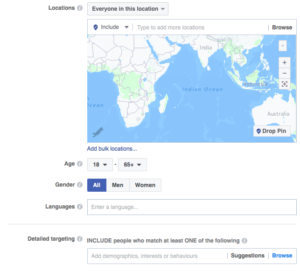 You can target the people you want to reach on Facebook based on location, gender, age, and interests. If you know your target audience greatly, you’ll be able to reach only those who matter with your campaign, thus get a higher conversion rate. 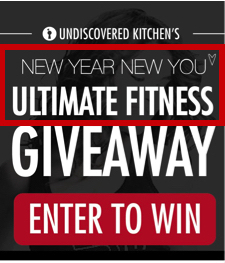 Have you ever joined a contest before, and gotten emails from the brand after the contest has ended? For most brands, creating contests where the contestant has to fill in their email, for example like the voting process, is a way to get more people in their marketing funnel, and be able to promote their products over and over again through email. The first method you should use is to send automated emails to everyone who is entering with their email. Because it gives you an opportunity to convert them right of the bat. 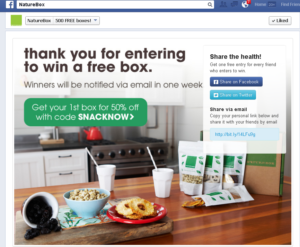 Just look at how NatureBox attracts their contestants with a “50% off box” right after they have entered their contest. And when they are the most eager and excited to win one. A very clever and effective method to convert people right from the start. Another, and highly broadly used method is to promote the product you are giving away. Lastly, sending an email once the contest is over is recommended. Notify those who haven’t won, but shed light on the positive. For example, you can write something like this: “We are sorry to inform you that you are not a winner in the ___ contest, however, we are excited to announce that the price of all our ___ that we gave away on the giveaway have been reduced by 50%! Only for a limited time”. This makes people eager to buy it, because of the disappointment of not winning one. Obviously, it’s difficult to sell a product that they believe or hope they will win, so after the giveaway ends is the perfect time. There’s a difference between giveaways, contests, and sweepstakes. With giveaways and sweepstakes, a winner is selected at random, like RandomPicker. However, with contests, it’s a bit different. Contests means selecting a winner based on the best entry/contribution. While they are quite similar, contests demands the contestants to join by submitting an entry based on the rules. It can be anything from drawing a drawing, to coming up with a new slogan for a brand. Giveaways usually demand something as simple as a share or like, and obviously, you can’t rate the “best” share, other than the page with the most followers etc. but that would mean missing out on a ton contestants, because those with few followers would be discouraged to join. Both are highly effective, however, they work a bit differently, so make sure you clearly state what type of campaign you are running. Social media contests are great for marketing purposes. But what is it, really, that makes them great? First of all, they help with brand awareness, email sign ups, building your audience, ultimately drive sales. And the great thing is that all of the other things also eventually lead to sales. We often hear that contests only attract people who are interested in winning the prize, and when they don’t they run away. In other words, there’s no real long-term benefit.